Dead Sea is a hypersaline lake with 34% salinity, gains its name due to the absence of any living macroscopic creatures. The lake consists of deeper northern basin and shallow southern basin which is recently dried up and used for commercial mineral production. The water level is dependent on the balance between amount of freshwater inflow and evaporation . Jordan River is the main source of freshwater inflow, in addition to several water springs and the complex system of underwater springs, which is recently discovered . The Dead Sea is an increasingly extreme environment due to continuous evaporation, UV radiation, high temperature and salinity [3, 4]. Na+ precipitates as halite while the salts of Mg2+ are more soluble. The present ionic composition is 2M Mg2+, 1.5M Na+, 0.5M Ca2+, 0.2M K+, 6.5M Cl-, 0.1M Br-, which inhibits most of the living forms . Another mineral-rich constituent of the Dead Sea is the mud. The therapeutic effect of processed Dead Sea mud is related to its high content of minerals . It has been demonstrated that Dead Sea salts and mud are useful in treating skin disorders and skin diseases such as psoriasis , dermatitis . Despite the extreme hypersaline environment, the Dead Sea is a unique ecosystem harbouring the various halophilic microorganisms adapted to its environment such as; unicellular green algae (Dunaliella), archaea (Haloferax, Haloarcula, Halobaculum and Halorubrum) and bacteria (Halomonas, Chromohalobacter, Salibacillus, Arthrobacter, Kocuria, Vibrio, Salinivibrio, Erythrobacter and Bacillus) [9, 10]. Halophilic microorganisms are known for various potential biotechnological applications such as; pigment production, hydrocarbon degradation, Polyhydroxy alkanoate production, halocin production, exopolysaccharide production, bioemulsifier production and halotolerant enzyme production [11, 12], most of these products are salt stable and carry out reactions efficiently under extreme conditions . Different antibiotics are now less effective due to bacterial resistant; therefore the demand for stable and efficient antibiotics is increasing worldwide. The present study focuses on isolation and screening of halophilic bacteria from Dead Sea mud for potential antimicrobial applications. Bacterial strains used in this study are listed in Table 1. The used bacterial strains were cultivated on Luria Broth medium (LB) as a complex medium (10g tryptone, 5g yeast extract, 10g NaCl, 15g agar (Bio Basic, Canada) for 1L, pH 7.5), or Mannitol-Glutamate medium (MG) as a minimal medium for Pseudomonas (10g mannitol, 2g L-Glutamic acid, 0.5g KH2PO4, 0.2g NaCl, 0.2g MgSO4.7H2O, 15g agar (Bio Basic, Canada) for 1 L, pH 7.0). Bacterial isolates obtained from the Dead Sea mud were cultivated in Marine Broth (MB) medium (10g tryptone, 5g yeast extract, 15g agar (Bio Basic, Canada) for 1L, pH 7.5) prepared by diluted Dead Sea water (salinity 3.2%). Table 1. Bacterial strains used in this study. Dead Sea mud samples (6) were collected in August 2014, the hottest month in Jordan, from shore close to Arab Potash Company in Jordan, where high salinity level in the mud due to the activity of the company in minerals harvesting from the Dead Sea (Fig. 1), geographic coordinates are shown in Table 2. Mud temperature, salinity and pH were measured in suit by a portable conductivity and pH meter (Ohause, China). The mud samples were used for bacterial isolation on MB, briefly, ten grams of Dead Sea mud were mixed with 90ml sterile Dead Sea water, incubated for 1h at 37°C, 250rpm, followed by a series of 10-fold dilution with sterile Dead Sea water, one hundred microliters of each dilution were spread on MB and incubated at 37°C for 24h. After incubation, colonies were counted for viable bacterial cells from each sample separately as CFU/ml. Single colonies were selected for further uses and cryopreservation in 15% Glycerol. Fig. (1). Map of Dead Sea showing six sampling sites: A, B, C, D, E and F.
Table 2. Geographic coordinates of the sampling sites, physiochemical properties of the mud and viable bacterial count of the samples. Preliminary screening for antagonistic isolates was conducted by agar plate assay based on described protocol by . The obtained isolates were used as antagonistic isolates against B. subtilis 6633 and E. coli 8739. The bacterial strains and isolates were grown on appropriate medium at 37°C for 24h, re-suspended in sterile 0.9% NaCl to an optical density (OD) 600 ~1.0 (approximately 107 CFU/ml), one hundred microliters of B. subtilis and E. coli were seeded separately on LB plates, after drying, ten microliters of bacterial isolates were applied separately on the inoculated plates and incubated at 37°C for 24h. Ten microliter of 25mg/ml of Chloramphenicol (Cm) and 10µl of sterile 0.9% NaCl were used as positive and negative control respectively. The plates were examined for growth inhibition zones caused by the isolates by visual inspection (Table 3). 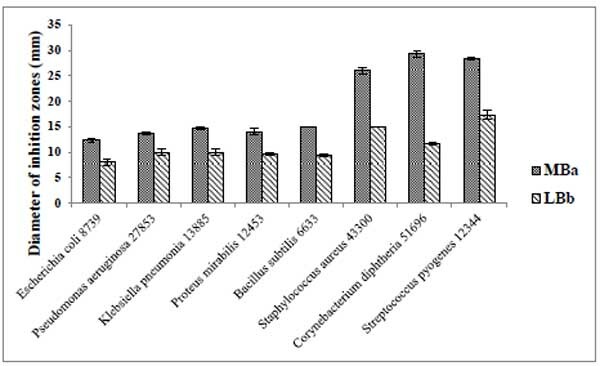 Four active isolates against E. coli 8739 and B. subtilis 6633, namely; 1-DSM, 5-DSM, 7-DSM and 24-DSM, were subjected to gram staining, biochemical characterization by API (Analytical profile index) 50CHB and API-E (BioMérieux, France) according to the manufacturer’s instructions [15, 16] Table 4, and 16S-rRNA amplification using the forward (5’-AGAGTTTGATCCTGGCTCAG-3’) and reverse (5’-TACGG(CT)TACCTTGTTACGCTT-3’) primers . In a total volume of 50µl, the reaction was performed as previously described by . The PCR amplicons were sequenced at Macrogen Inc., South Korea. To determine the phylogenetic affiliation, sequences were initially compared to the available databases by using nucleotide blast search at NCBI BLAST Website (https://blast.ncbi.nlm.nih.gov/Blast.cgi). Sequences of the closest relative were retrieved from the database and used to construct a phylogenetic tree using MEGA7 , by the Maximum Composite Likelihood method  (Fig. 2). The accession numbers of the 16S-rRNA used for comparison were: NR_041275.1 B. boroniphilus; NR_042274.1 B. foraminis; NR_104749.1 B. subterraneus; NR_108491.1 B. gottheilii; NR_109068.1 B. ginsengisoli; NR_109140.1 B. persicus strain B48; NR_133974.1 B. huizhouensis; NR_135898.1 B. rigiliprofundi; NR_137360.1 B. campisalis; NR_144741.1 B. mediterraneensis; NR_136792 B. crescens strain JC247 and AB018486 B. subtilis 6633. The GC contents of the sequences were calculated by Oligo Calculator (http://mbcf149.dfci.harvard.edu/docs/oligocalc.html) (Table 5). Fig. (2). Phylogenetic tree of the Dead Sea mud isolates and their close relatives based on 16S-rRNA. The sequences were retrieved from NCBI database. The evolutionary distances were computed using the Maximum Composite Likelihood method  and evolutionary analyses were conducted in MEGA7 . The most active isolate (24-DSM) was chosen for further study. In order to study salinity influence on fitness of 24-DSM, in vitro growth experiments were conducted. The isolate was cultured in LB and MB broth media at 37°C and 250rpm. The OD600 was monitored hourly until the culture had entered the late stationary phase. Three independent replicates were used for each medium, with ratio 1:5 of liquid medium to air (Fig. 3). Antimicrobial activity of 24-DSM was conducted by agar plate well diffusion assay, against 8 human pathogens Table (6), four of them were gram negative bacterial strains and 4 of them were gram positive. Active fresh culture of bacterial strains re-suspended in sterile 0.9% NaCl to an OD600 ~1.0, one hundred microliters of bacterial suspension were seeded on Muller Hinton agar (Bio Basic, Canada) plates separately. The 24-DSM was cultivated in LB and MB liquid medium at 37°C and 250rpm, the cultures were cultivated at late exponential phase OD600 ~1 and OD600 ~2 in MB and LB medium respectively, centrifuged at 4000rpm. The supernatant were filtered by 0.22µm filter for removal of bacterial cells, desalted by XAD-4 resin (Sigma-Aldrich, USA), and concentrated 10 times (10X) by vacuum concentrator (Eppendorf, Germany). Three independent cultures were used for each medium as replicates. Ten microliters of the 10X supernatants were loaded in 4mm in diameter well, chloramphenicol was used as a positive control (10µl of 25mg/ml), and 10µl of 10X desalted medium was used as a negative control. The inoculated plates were incubated at 37°C for 48h, growth inhibition zones were monitored by visual inspection (Fig. 4). The influence of medium used for 24-DSM cultivation has been analyzed by ANOVA and least significant differences at P = 0.05 using SPSS Statistics 21. The MIC of 10X supernatants was determined by a two-fold dilution assay in Mueller-Hinton broth (MHB) medium (Bio Basic, Canada). All tests were done in triplicates according to the National Center for Clinical Laboratory Standards recommendations . The Bacterial strains were incubated at 37°C, MHB was used as a blank and MHB inoculated with test strains was used as growth control. Bacterial growth was examined visually after 24h of incubation. The MIC was considered as the lowest volume of 10X supernatants that completely stopped visible cell growth, in general, differences in MIC values were considered significant if they were at least four-fold, this cut-off is consistent with previous publications . Fig. (3). In vitro growth of 24-DSM in LB and MB medium at 37°C as determined by measurement of the OD600. Data represent the means of three independent cultures ± standard deviation. Fig. (4). Antagonistic assay against different bacterial strains by the 10X concentrated 24-DSM supernatants; as a representative samples A: Escherichia coli 6633, B: Corynebacterium diphtheria 51696. Bacterial strains suspension (100 µl of OD600 ~1.0) were spread on MHB agar medium, after drying, 10 µl of 10X concentrated 24-DSM supernatants were loaded in 4mm in diameters well (R1, R2 and R3), 10 µl of 12.5 mg/ml of chloramphenicol was used as positive control (Cm) and 10 µl of 10X desalted medium was used as a negative control (-ve). The mud samples were highly saline with a range of 40-45%, the pH values of the samples were 5.7 to 6.4 and relatively high in suit temperature with the range 37 to 40. These results indicate the high acidic salinity of the mud samples. In spite of these harsh conditions, the viable bacterial counts in the samples were relatively high ranging from 6.83 X 103 to 2.53 X 105 (Table 3). Table 3. Preliminary screening for antagonistic activity of Dead Sea mud isolates against E. coli 8739 and B. subtilis. *Average of three replicates ± standard error of means, 10µl of OD600 ~1.0 isolates suspension spotted on plate previously seeded with bacterial strains; 10µl of 25mg/ml chloramphenicol (Cm) and 10µl of 0.9% NaCl were used as positive and negative control respectively. Twenty-Four different isolates were chosen based on collection site and colony morphology to be used in preliminary screening for antagonistic isolates. Ten different isolates were able to form inhibition zones on plates inoculated separately with E. coli 8739 and B. subtilis 6633. But only, four of these isolates were able to inhibit growth of both E. coli 8739 and B. subtilis 6633, namely; 1-DSM, 5-DSM, 7-DSM and 24-DSM, where inhibition zones ranged from around 7.5 to 9 mm in diameter in case of E. coli 8739 and from around 3.5 to 12 mm in diameter in case of B. subtilis 6633. Another 4 isolates were able to inhibit E. coli 8739 growth only and 2 isolates were able to inhibit B. subtilis 6633 growth only (Table 3). In this study, the four isolates which were able to inhibit both E. coli 8739 as a gram negative model organism and B. subtilis 6633 as a gram positive model organism were identified based on gram staining, biochemical characterization and 16S rRNA analysis. The four isolates were gram positive and had had the same biochemical properties Table 4. For instance, all possess catalase, oxidase and urease enzymes, able to produce Indole and acetone, reduce nitrates, hydrolyze gelatin and utilize the same set of carbon compounds. These biochemical properties were all shared by the reference strain B. subtilis 6633. Analysis of the 16S rRNA revealed that the four isolates were found to be very close to Bacillus species with identity 96-98%. The closest relative to each isolates is shown in Table 5 and Fig. (2). The 16S rRNA sequences revealed a relatively high GC content (up to 55%). Nucleotide sequence accession number for 24-DSM generated in this study has been deposited in GenBank under accession number MF037224. Table 4. Some physiological properties of Dad Sea mud bacterial isolates. +: indicates positive reaction; - : indicates negative reaction. In order to test the salinity effect on overall fitness of 24-DSM (the most active isolate), in vitro growth experiments were conducted. The isolate was cultured in LB and MB at 37°C. The OD600 was monitored continuously until cultures had entered the late stationary phase (Fig. 5). Growth of 24-DSM was generally faster in MB than that in LB with doubling times of ~60 min in MB and ~90 min in LB. The culture reached the stationary phase within 6h with an OD600 of ~1 in MB, while in LB the stationary phase was reached at OD600 of ~2. 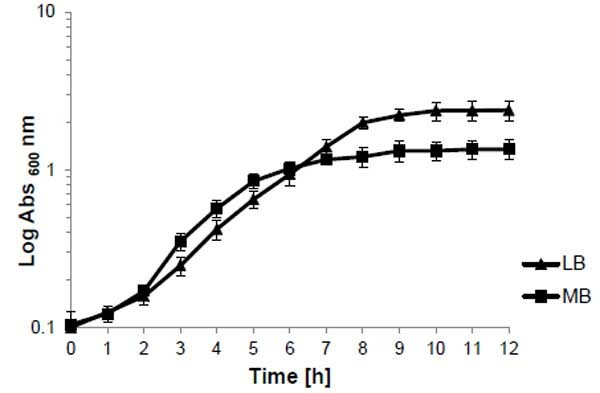 These results demonstrate that the salinity contributes to in vitro fitness of 24-DSM. Fig. (5). Susceptibility of different bacterial strains to 10X concentrated 24-DSM supernatants by agar plate diffusion assay. Average of three replicates ± standard error. Bacterial strains suspension (100 µl of OD600 ~1.0) were spread on MHB agar medium, after drying, 10 µl of 10X concentrated 24-DSM supernatants were loaded in 4mm in diameters well. a,b: ANOVA and least significant differences at P = 0.05 using SPSS Statistics 21 for cultivation medium. Susceptibility of different gram negative and gram positive bacterial strains toward 24-DSM was tested by agar plate diffusion assay and MIC determination using the desalted-10X concentrated-supernatants of 24-DSM cultivated separately in MB and LB media (Table 5). The results showed that the desalted-10X concentrated-supernatants of 24-DSM that cultivated in both media were able to inhibit the tested bacterial strains. The Diameters of inhibition zones caused by 24-DSM cultivated in MB (range from ~12 to ~29 mm) were significantly higher than that caused by 24-DSM cultivated in LB (range from ~8 to ~17 mm). In contrast to the MIC values, there was no significant influence for the used cultivation medium on the values of MIC, except for C. diphtheria 51696, since the MIC value of the desalted-10X concentrated-supernatants of 24-DSM cultivated in MB is 8-fold lower than that cultivated in LB medium, if we consider at least 4-fold difference is a significant difference. These results indicate that the salinity in MB medium might enhance the antimicrobial activity of 24-DSM mainly against C. diphtheria 51696. It was remarkable to mention that, in both cultivation media, the gram positive bacterial strains were more susceptible to the desalted-10X concentrated-supernatants of 24-DSM than gram negative bacterial strains as shown in Table 6. Table 5. Closest relatives of the Dead Sea mud isolates with their identity percentage. Isolates with more than 97% are considered to be the same species. Table 6. MIC determination 10X concentrated 24-DSM supernatants to some bacterial strains. * MIC determination in MHB medium by the dilution assay was repeated three times in each case thereby confirming consistencies of MIC values. Differences in MIC values were only considered significant if they were at least 4-fold. The physicochemical properties of the Dead Sea mud samples were analyzed. The salinity percentage was found to be very high (up to 45%) and the pH was found to be acidic (up to 6.4), these are typical properties of Dead Sea water, which making the Dead Sea as the most well-known hypersaline environment [23, 24]. In spite of these harsh conditions, the number of viable bacterial cells in the tested mud samples were very high, reached 2.5 X 105 CFU/ml, in comparison to the bacterial cell count in open sea marine water, where it reaches up 3 X 106 bacterial cell/ml , despite that these number was obtained by using unspecific fluorescent staining techniques . Many studies have proved that the black, hypersaline Dead Sea mud is useful in treating skin disorders and diseases. Therefore, the mud has been extensively used in mud packs, masks, topical body and facial treatments in spas surrounding the lake, and as a base for the preparation of soaps, creams, and ointments for skin care marketed worldwide . Little is known about the microbiological aspects of the Dead Sea mud. Therefore, this research was conducted to expand our knowledge about bioactive halophilic bacteria living in such hypersaline conditions. Halophilic bacteria have been previously isolated from Dead Sea Cost, Jordan  and Dead Sea water . In this study, twenty four different isolates were isolated from form Dead Sea mud (Data not shown). In the preliminary screening for antimicrobial properties of these isolates, ten of these isolates showed antimicrobial activity. But only, four isolates showed antimicrobial activity against both model bacterial strains Escherichia coli 8739 and Bacillus subtilis 6633, namely, 1-DSM, 5-DSM, 7-DSM and 24-DSM. These isolates were subjected for further identification, they were gram positive bacteria, it was reported that gram positive bacteria have adapted to environmental stress such as high salinity through anionic phospholipids in the membrane composition [28, 29]. These four isolates belong to the genus Bacillus which is mostly saprophytes, commonly found in soil; a few are animal, especially insect, parasites or pathogens . The isolates characterized by high GC content up to 55%, these results are in agreement with Jacob results (2012), where he suggested that the thick cell wall, high peptidoglycan content, high GC content and resistant-spore formation are the main reasons for the survival of Bacillus in such a harsh condition of high salinity . The newly characterized isolates possess catalase and oxidase enzymes like B. halosaccharovorans sp. Nov., which was isolated from hypersaline lake , and showed Bacillus profile, for some enzymatic activity and carbohydrate metabolism, that suggested by . Bacillus isolates described in this study belong to Bacillus crescens and Bacillus persicus, these species were encountered in salty environment [32, 33]. The 1-DSM and 7-DSM are very close related (96% identity) to B. crescens strain JC247 isolated from soil samples collected from Rann of Kutch, Gujarat, India  and 5-DSM and 24-DSM are very similar (98% identity) to B. persicus strain B48, which is a novel species isolated from hypersaline lake in Iran . 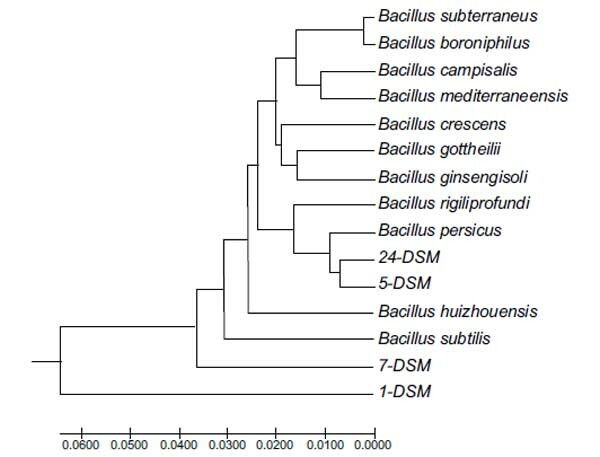 The 24-DSM and 5-DSM have been clustered with B. persicus in the phylogenetic tree based on 16S rRNA sequences. Therefore, the isolate 24-DSM is assigned as new strain of B. persicusi isolated from the Dead Sea mud. Growth on different NaCl concentration is used to distinguish Bacillus species . In this study, the salinity effects on overall fitness of 24-DSM and its antimicrobial activity have been investigated. Although, 24-DSM growth was faster in MB (3.2% salinity) than in LB (1% salinity), it was not able to reach high population. In spite of these, 24-DSM antimicrobial activity was higher, when it was cultivated in higher saline. This significant effect was clearer against gram positive bacteria, mainly; C. diphtheria, followed by S. pyogenes and S. aureus, by using agar plate diffusion assay, but this significance has disappeared when MIC technique was used except in C. diphtheria, where the difference in MIC value was 8-fold. These results are in parallel with other results, the susceptibility of C. diphtheria to a wide range of antimicrobial agents has been demonstrated . In contrast with other results where S. pyogenes has been found to be resistance to some macrolides but susceptible to clindamycin and miocamycin  and meticillin-resistant S. aureus has been reported as an emerging threat . The antimicrobial properties of Dead Sea mud were related to the chemical and physical properties of the mud , it has been recently reported that halophilic microorganisms from the Dead Sea could be used in biotechnological application such as extracellular protease production, Polyhydroxy alkanoates production, halocin production and bio-emulsifier production , Zinc and Copper removal , Lead and Cadmium removal . In this study, isolation of halophilic microorganisms from the Dead Sea mud for antimicrobial application was reported. Further investigation will be conducted for the identification of potential antimicrobial compound. Four Bacillus isolates were isolated from Dead Sea mud, the antimicrobial activity was observed for these isolates. The most active isolate in antimicrobial activity was assigned as Bacillus persicus 24-DSM and it was found to be active against some gram positive and negative bacterial strains. This finding might open the door for utilizing halophilic microorganisms found in the Dead Sea in new antibiotics production. The author declares no conflict of interest, financial or otherwise. The author would like to thank Hamdi Mango Center for Scientific Research where this research was conducted and Scientific Research Support Fund for instruments support. Special thanks to Miss Ihsan Mutlak and Miss Amani Al-Dokh for their technical helps. Ionescu D, Siebert C, Polerecky L, et al. Microbial and chemical characterization of underwater fresh water springs in the dead sea. PLoS One 2012; 7(6): e38319. Oren A, Gavrieli I, Gavrieli J, Kohen M, Lati J, Aharoni M. Microbial communities in the dead sea past, present and future. Adaptation to life at high salt concentrations in Archaea, Bacteria, and Eukarya 2005; 27-39. Romanovskaia VA, Avdeeva LV, Gladka GV, Pritula IR, Kharkhota MA, Tashirev AB. Resistance of microorganisms of coastal ecosystems of the Dead Sea to extremal factors. Mikrobiolohichnyi zhurnal (Kiev) 2013; 75(3): 3-11. Oren A, Gunde-Cimerman N. Fungal life in the dead sea. biology of marine fungi 2012; 115-32. Abu-Jdayil B, Mohameed HA. A facial mask comprising Dead Sea mud. J Cosmet Sci 2006; 57(6): 441-54. Halevy S, Giryes H, Friger M, Sukenik S. Dead sea bath salt for the treatment of psoriasis vulgaris: a double-blindr contolled study. J Eur Acad Dermatol Venereol 1997; 9(3): 237-42. Oren A. The dying Dead Sea: the microbiology of an increasingly extreme environment. Lake Reserv Manage 2010; 15(3): 215-22. Jacob JH. Classification of halophilic heterotrophic bacteria thriving in the jordanian dead sea littoral zone. J Biol Sci 2012; 12(4): 246-52. Oren A. Industrial and environmental applications of halophilic microorganisms. Environ Technol 2010; 31(8-9): 825-34. Satbhai A, Kasodekar A, Pachuau L, Bharambe N. Isolation of halophiles from the dead sea and exploring their potential biotechnological applications. Int J Curr Microbiol Appl Sci 2015; 2: 1-17. Kumar S, Karan R, Kapoor S, S P S, S K K. Screening and isolation of halophilic bacteria producing industrially important enzymes. Braz J Microbiol 2012; 43(4): 1595-603. Logan NA, Berkeley RC. Identification of Bacillus strains using the API system. J Gen Microbiol 1984; 130(7): 1871-82. Carpana E, Marocchi L, Gelmini L. Evaluation of the API 50CHB system for the identification and biochemical characterization of Bacillus larvae. Apidologie (Celle) 1995; 26(1): 11-6. Heyer J, Galchenko VF, Dunfield PF. Molecular phylogeny of type II methane-oxidizing bacteria isolated from various environments. Microbiology 2002; 148(Pt 9): 2831-46. Al-Karablieh N, Mutlak I, Al-Dokh A. Isolation and identification of Pseudomonas viridiflava, the causal agent of fruit rotting of cucumis sativus. J J Agri Sci 2017; 13(1): 79-91. Kumar S, Stecher G, Tamura K. MEGA7: Molecular evolutionary genetics analysis version 7.0 for bigger datasets. Mol Biol Evol 2016; 33(7): 1870-4. Tamura K, Nei M, Kumar S. Prospects for inferring very large phylogenies by using the neighbor-joining method. Proc Natl Acad Sci USA 2004; 101(30): 11030-5. Al-Karablieh N, Weingart H, Ullrich MS. The outer membrane protein TolC is required for phytoalexin resistance and virulence of the fire blight pathogen Erwinia amylovora. Microb Biotechnol 2009; 2(4): 465-75. Oren A. Biodiversity in highly saline environments.Physiology and Biochemistry of Extremophiles 2007; 223-31. Bodaker I, Beja O, Sharon I, et al. Archaeal diversity in the dead sea- microbial survival under increasingly harsh conditions 2009; 15. Zweifel UL, Hagstrom A. Total counts of marine bacteria include a large fraction of non-nucleoid-containing bacteria (ghosts). Appl Environ Microbiol 1995; 61(6): 2180-5. Porter K, Feig Y. The use of DAPI for identification and enumeration of bacteria and blue-green algae. Limnol Oceanogr 1980; 25: 943-8. Tarawneh KA, Wedyan MA, Al-zou’bi M, Khleifat KM, Tarawneh A. Isolation and characterization of halophilic bacteria from the dead sea coast, Jordan. Adv Environ Biol 2008; 2(2): 63-9. Battistuzzi FU, Hedges SB. A major clade of prokaryotes with ancient adaptations to life on land. Mol Biol Evol 2009; 26(2): 335-43. López CS, Alice AF, Heras H, Rivas EA, Sánchez-Rivas C. Role of anionic phospholipids in the adaptation of Bacillus subtilis to high salinity. Microbiology 2006; 152(Pt 3): 605-16. Claus D. Genus Bacillus Cohn 1872, 174 In 1986; 2(Pt 3): 1105-39. Mehrshad M, Amoozegar MA, Didari M, et al. Bacillus halosaccharovorans sp. nov., a moderately halophilic bacterium from a hypersaline lake. Int J Syst Evol Microbiol 2013; 63(Pt 8): 2776-81. Didari M, Amoozegar MA, Bagheri M, et al. Bacillus persicus sp. nov., a halophilic bacterium from a hypersaline lake. Int J Syst Evol Microbiol 2013; 63(Pt 4): 1229-34. Shivani Y, Subhash Y, Dave Bharti P, Sasikala Ch, Ramana ChV. Bacillus crescens sp. nov., isolated from soil. Int J Syst Evol Microbiol 2015; 65(8): 2531-6.
 von Hunolstein C, Scopetti F, Efstratiou A, Engler K. Penicillin tolerance amongst non-toxigenic Corynebacterium diphtheriae isolated from cases of pharyngitis. J Antimicrob Chemother 2002; 50(1): 125-8. Alós JI, Aracil B, Oteo J, Gómez-Garcés JL. Significant increase in the prevalence of erythromycin-resistant, clindamycin- and miocamycin-susceptible (M phenotype) Streptococcus pyogenes in Spain. J Antimicrob Chemother 2003; 51(2): 333-7. Zetola N, Francis JS, Nuermberger EL, Bishai WR. Community-acquired meticillin-resistant Staphylococcus aureus: An emerging threat. Lancet Infect Dis 2005; 5(5): 275-86. Ma’or Z, Henis Y, Alon Y, Orlov E, Sørensen KB, Oren A. Antimicrobial properties of dead sea black mineral mud. Int J Dermatol 2006; 45(5): 504-11. Al-Momani FA, Massadeh AM, Hadad YA. Uptake of zinc and copper by halophilic bacteria isolated from the dead sea shore, Jordan. Biol Trace Elem Res 2007; 115(3): 291-300. Massadeh AM, Al-Momani FA, Haddad HI. Removal of lead and cadmium by halophilic bacteria isolated from the dead sea shore, Jordan. Biol Trace Elem Res 2005; 108(1-3): 259-69.